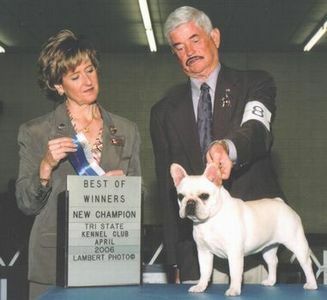 JJ was whelped on June 25, 2005 and hit the show ring in the Spring of 2006. 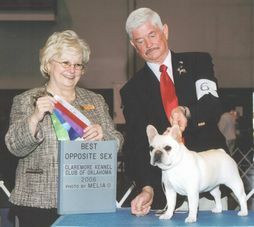 JJ took WB/BOS/Best BBE Frenchie, BBE GROUP 1 and BEST BRED BY EXHIBITOR IN SHOW at the Claremore Kennel Club show in May 2006! She finished her Championship in very short order with three 4 Point Majors and a 5 Point Major with several BOS over specials and a BOB! JJ is a very correct, typey Frenchie with excellent movement and attitude! Watch for her ocassionally in the Specials ring until she matures. 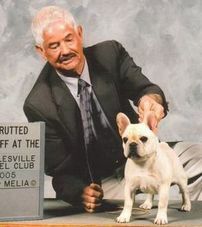 JJ's sire, CH House Of Tucks Buddie, "Buddie", is producing top quality off spring. He has sired three litters with all except one finishing due to loosing him to a very unfortunate accident. Two of his sons are now being offered at stud. See our Stud Dogs page. 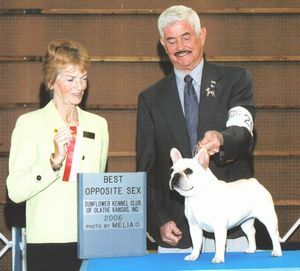 JJ winning Best BBE in Show! JJ pictured finishing her Championship with a 5 Point Major! 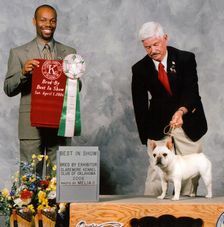 Copyright © 2005 - 2006 House Of Tucks French Bulldogs, Doherty Kennels & JLS Canine Services Web Design.